Sadiq Khan has rejected US presidential hopeful Donald Trump's offer to make the new London mayor an "exception" to a ban on Muslims travelling to the US. "This isn't just about me. It's about my friends, my family and everyone who comes from a background similar to mine, anywhere in the world," he said. Mr Khan also warned that Mr Trump's "ignorant" views of Islam "could make both our countries less safe". Mr Trump said he was "happy" that Mr Khan would be leading London. "If he does a good job and frankly if he does a great job, that would be a terrific thing," he added. Mr Khan told the BBC he was supporting Hillary Clinton - who is vying for the Democrat nomination - in her bid for the White House, adding: "I hope she trounces him." Last year, Mr Trump, the Republican presidential hopeful, called for a temporary halt to all Muslims entering the US in the wake of the deadly terror attack in San Bernardino, California. 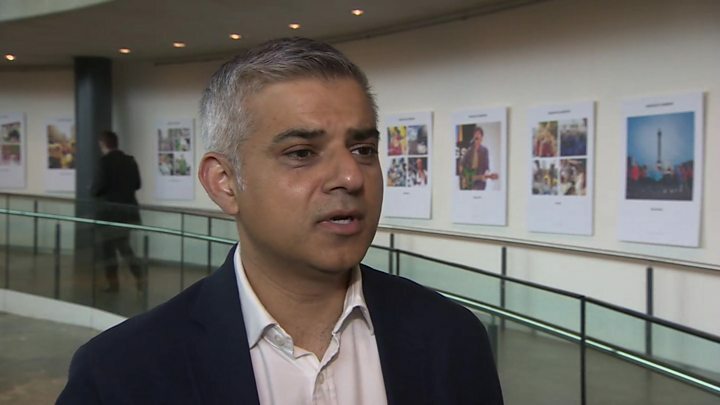 Mr Khan, the son of Pakistani immigrants and now London's first Muslim mayor, expressed concern during his election campaign that he would not be able to visit the US, if Mr Trump were elected, because of his faith. Asked by the New York Times how the ban would apply to Mr Khan, Mr Trump said: "There will always be exceptions." But in response, the new London mayor said: "This isn't just about me - it's about my friends, my family and everyone who comes from a background similar to mine, anywhere in the world." He added: "Donald Trump's ignorant view of Islam could make both our countries less safe - it risks alienating mainstream Muslims around the world and plays in to the hands of the extremists. Mr Khan officially took office on Saturday following Thursday's election, which saw him defeat his Conservative rival Zac Goldsmith by 1,310,143 votes to 994,614 - giving him a larger personal mandate than either of his predecessors Boris Johnson and Ken Livingstone. Mr Khan accused the Conservatives of using tactics "straight out of the Donald Trump playbook" in their campaign against him during the mayoral race, saying: "They used fear and innuendo to try to turn different ethnic and religious groups against each other." But senior Conservatives including Chancellor George Osborne and Defence Secretary Michael Fallon have defended the tone of the Tory campaign, saying it was part of the "rough and tumble" of an election.